SEO Reseller Platform * White Label SEO Outsource Provider. With 12 years in the industry we stand behind our product. Sell a product you can believe in. Live anywhere in the world. Earn like an SEO BOSS! and your future is yours. Complete turn key SEO Reseller solution. Simply add a deal and we do the rest! Easy per keyword pricing. Use our SEO Desk to manage your customers as well as offer a branded login page for them to manage their campaign. By joining our SEO Reseller program you have the ability to offer 30 day trials of our paying service with no credit card required. Commissions are paid at the time of the sale instantly to your paypal account or we bill your credit card at wholesale pricing. Our SEO Platform is trusted by over 150 resellers across the globe. Managing 43,000+ campaigns and counting! Our advanced algorithms manage the tedious tasks to free your time. Our SEO pro’s monitor the automated parts and intervene where needed. We work in the background, completely hidden from your customers. We focus on relevancy and all link placements are easily disabled or changed. Ranking reports and 3rd party analytics come standard for each live account. 12 years in business and thousands of successful campaigns. It simply works. 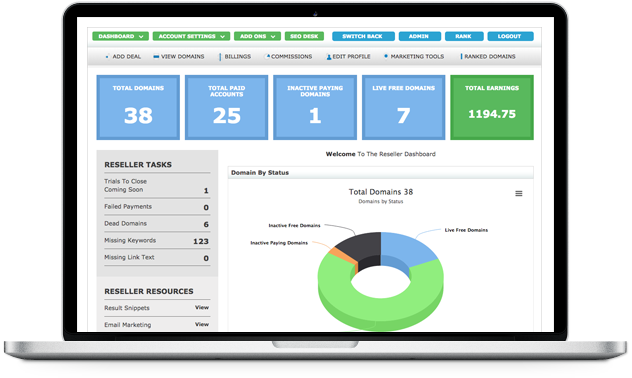 Track and manage all your customers from a simple to use SEO Desk! Login from any device to manage your campaign with ease! Great product. It's well worth the money. And it saves alot of money in SEO specialist. We offer several options to give you a solution that works for your business model. You bill your customers and pay us rock bottom pricing per keyword. We walk you through our platform and show you how to sell with custom tools and reporting. We can bill your customer and pay you 50% residual commissions at the time of the transaction. With residual earnings you can make money while you sleep! Live the life of your dreams. Discounts are available for large keyword quantities. Special conditions apply. Sell to other agencies and resellers to maximize residual income and sky rocket profits!